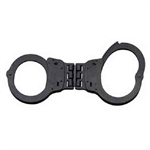 ASP Investigator Handcuff Case - Chain/Hinge a bench made blend of the finest material in a series of clean, functional designs. The ASP Investigator Handcuff Case is compact and easily concealable. Designed to fit on a Non-Duty belt. This cuff case is built to be compatible with ASP Chain/Hinge cuffs.